When a fishing guide takes you out and you don’t catch any fish, he may say “Gee, you should have been here last week, they were jumping into the boat.” Yeah, right. When a dive master takes you diving and you come up ask where the coral reef is, she may say, “Gee, you should have been here 40 years ago; it was healthy and beautiful with coral growth and tropical fish all over the place.” And so it was. And I was there also. Coral heads were massive, great stands of elkhorn coral reached for the surface and the shallow reefs were topped with extensive growths of fire coral, Milleporacomplanata. All of these corals had different species of fish and invertebrates that live to a greater or lesser extent within the special environment that that species of coral creates. Food, shelter, reproductive substrates-the coral provide the special environmental conditions that helped that species survive in the “eat or be eaten” world of a coral reef. And it was, and still is, one of the most wondrous environments on Earth. The company I started in 1973, Aqualife Research Corporation, moved to Marathon in the Florida Keys in late 1974 and I had the great opportunity to live, work, and dive in the Florida Key for ten years. Forrest joined me in, I think it was 1978, and we worked together until 1984 on the culture of clownfish, gobies, Atlantic angelfish, and many other species of reef fish, including the yellowtail reef fish, Microspathodonchrysurus. The juveniles of this species carried the common name of jewelfish at that time because of the brilliant iridescent blue spots that covered the body. 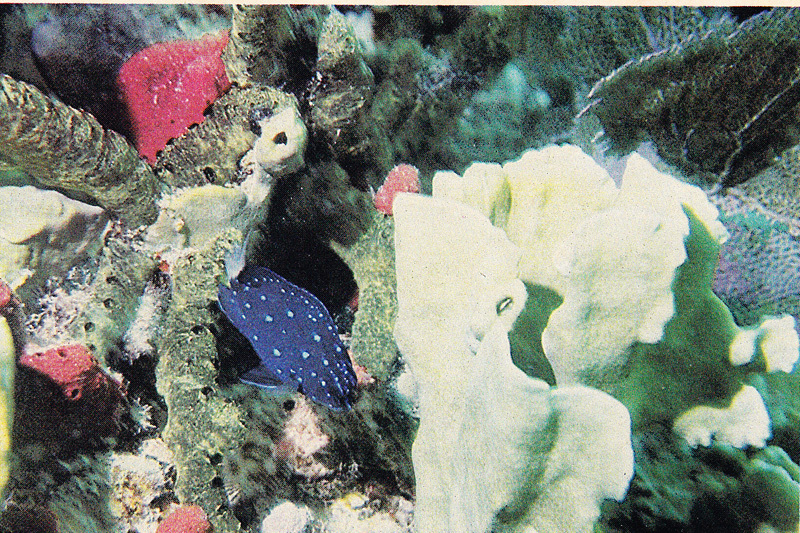 These spots disappear as the fish attains the adult coloration of a drab dark brown body and bright yellow tail. Despite their aggressive nature, their constant movement and bright coloration made them a popular fish for marine aquariums at the time. They are a good species for reef tanks if kept one per tank. Unfortunately, however, the coral reefs, at least what they were in 1970s and early 80s, did die, or at least greatly diminish. Those vast expanses of fire coral that topped the reefs are gone, and so also the yellowtail reef fish and their stunningly beautiful jewelfish juveniles are now very hard to find. Florida’s coral reefs have declined for many reasons: pollution, storms, overfishing, over visitation, and disease of both corals and invertebrates. Perhaps the most critical loss of biodiversity was the almost total annihilation of the keystone herbivore of the Atlantic coral reefs, the long-spined sea urchin, Diademaantillarum, in a great plague that swept from the Panama Canal through this great oceanic region all the way to Bermuda in the space of 13 months in 1983. Within weeks macro algae began to overtake the Atlantic coral reefs and this is still the case today. These urchins have not recovered, their ecological function of herbivory is still absent and the reefs continue to decline. But now we can culture these difficult urchins, and after six years of effort I am close to completion of a functional technology for small scale urchin larvae culture, and I hope that this will stimulate more effort to restore this keystone herbivore to Atlantic coral reefs. Then perhaps the fire coral reefs and the jewelfish will return. 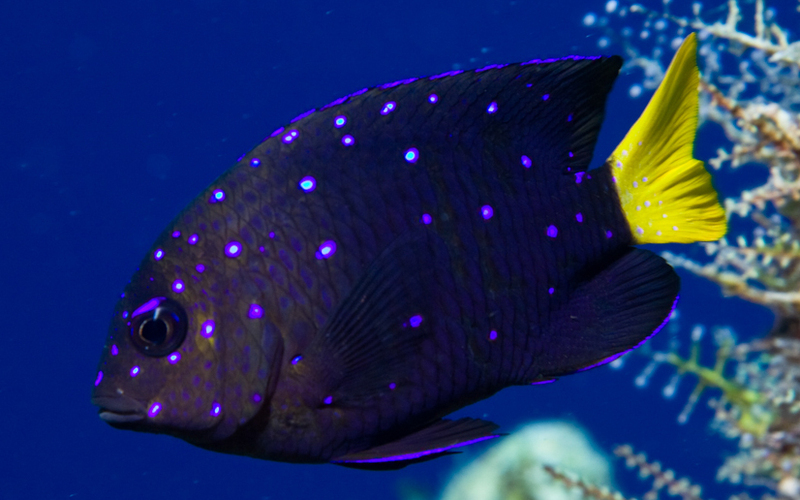 The yellow-tailed damselfish, Microspathodonchrysurus, or marine jewelfish as it is known in the hobby, is one of the hardiest and most colorful of the Atlantic damselfish. Juveniles exhibit a striking coloration of iridescent neon blue spots against a midnight blue background. This fades in intensity as the fish matures and only a few small blue spots remain on the drab, dark brown adult. Also, the color of the caudal fin changes from clear in the juvenile to a bright yellow on the adult, hence the origin of the accepted common name. In nature, adult and juvenile jewelfish arc found almost exclusively among the flat, branching growths of fire coral, principally Milleporacomplanata. The fire coral affords the jewelfish protection from predators, reproductive sites, and even food since stomach contents are composed of algae and detritus common to fire coral reefs as well as elements of the fire coral itself. 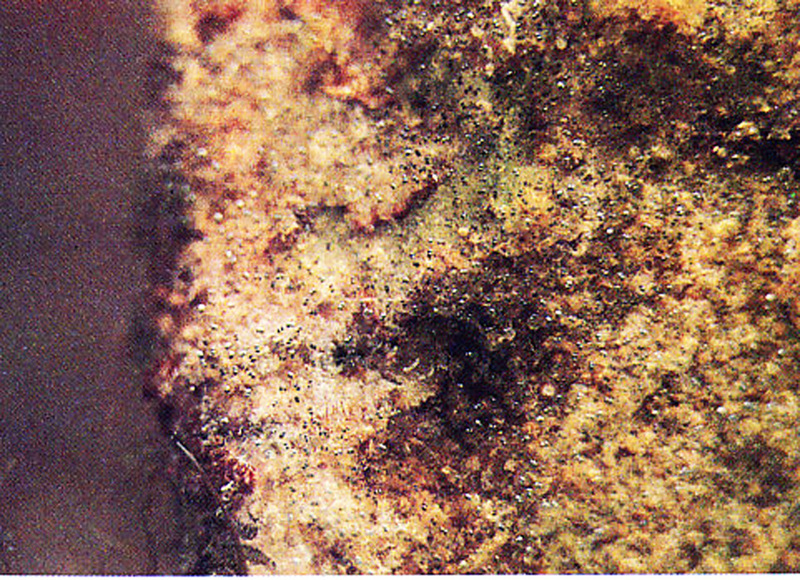 Ciardelli (1967) examined stomach contents of juvenile jewelfish and found a variety of vegetable and animal matter including nematocysts (stinging cells) that apparently were from Millepora. He feels that the ingestion of fire coral by juvenile jewelfish may explain their close relationship with the shallow fire coral reefs. 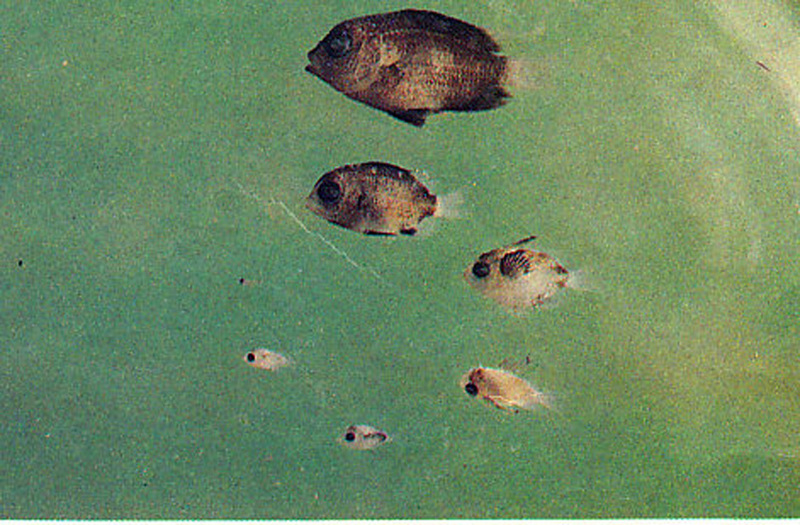 Unlike other damselfish in the same environment, Randall ( 1967) reports that jewelfish were never observed feeding on planktonic organisms, but restricted their diet to benthic algae with a small amount of animal matter. He also describes cleaning behavior, removal of ectoparasites by juvenile jewelfish from large grey angelfish. 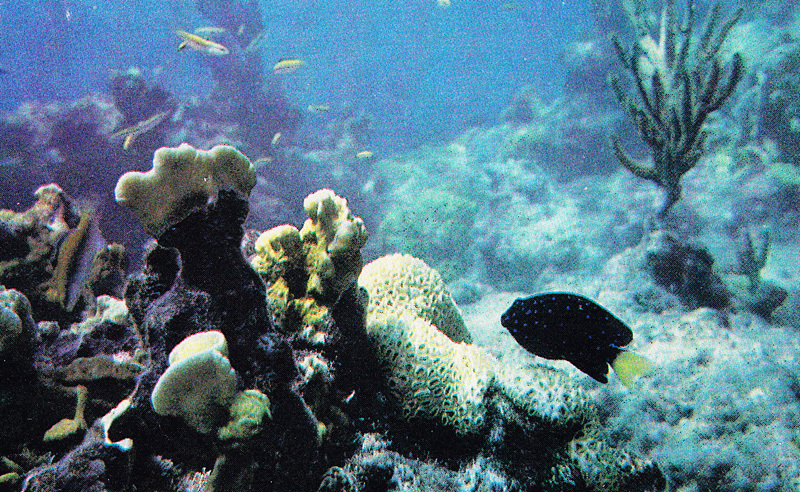 Emery (1968) reports that benthic animals are important in the diet of the juveniles, including coral polyps and sponge, and that adults gradually switch to almost exclusively benthic algae. The newly hatched larvae are so small, less than l/16″ long, and so slight and transparent that they are almost invisible. Those that peer into a tank of newly hatched jewelfish for the first time are incredulous that they cannot see a one of the 15,000 fish that are swimming about in the tank. However, a little searching soon reveals the presence of the diminutive larvae. One newspaper reporter was sure that he had drunk water with more critters in it than he could see in a tank of larval jewelfish. A blade of dead, fire coral, Milleporacomplanata, almost covered with eggs in various stages of development of the Atlantic Jewelffish, Microspathodonchrysurus. 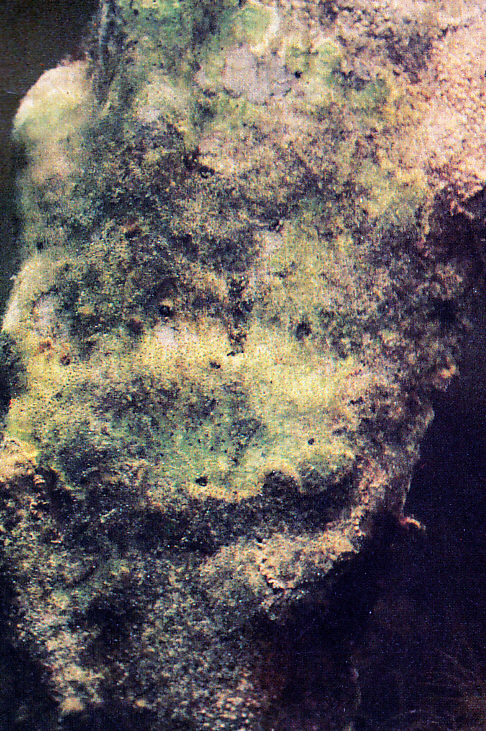 Tiny filamentous algae and jewelfish eggs cover the flat surface of the nest. The male guards the nest with vigor and few dare to incite his wrath by disturbing the nest. The larval period for jewelfish extends to 4 weeks and the post larval period may take an additional 3 to 4 weeks before juvenile form and color are attained. The total length of the fish exceeds 1/2″ before the Post larval period is complete. The most obvious structural development of the larval jewelfish is the greatly enlarged pectoral fins. During this early period, the pectoral fins extend posteriorly to almost the caudal fin and spread outward a distance equal to about the depth of the body. These large laterally spread fins greatly increase the horizontal surface area of the fish, an adaptation that provides support and mobility in the pelagic environment. These pectoral fins are always spread and give the diminutive fish the appearance of flying through the water. ln fact, they look for all the world like miniature delta wing aircraft pursuing some important mission as they cruise tirelessly throughout the tank. They pause only to sight on and strike at food organisms. Apparently, jewelfish require fire coral reefs for survival in the wild, and this type of habitat, while not at all a rare kind of reef formation; it still does not cover broad expanses like grass flats or the soft coral – hard rubble bottoms. A journey of many miles might be required of the tiny post larval fish before it encounters a fire coral formation. We consider it quite possible that the extensive pectoral fin development, active swimming mode, and the prolonged period of larval and post larval stages are adaptations that provide young jewelfish the means of finding the relatively restricted type of habitat required for survival. Jewelfish are distributed on fire coral reefs from Florida to Brazil and the extended duration and mobility of the early stages must enhance such wide distribution to a restricted habitat. The energy expended in the larval stage slows growth and prolongs the dangerous pelagic period, but these disadvantages are apparently compensated by the ability to find the fire coral reefs. The developmental sequence of the Atlantic Jewelfish. 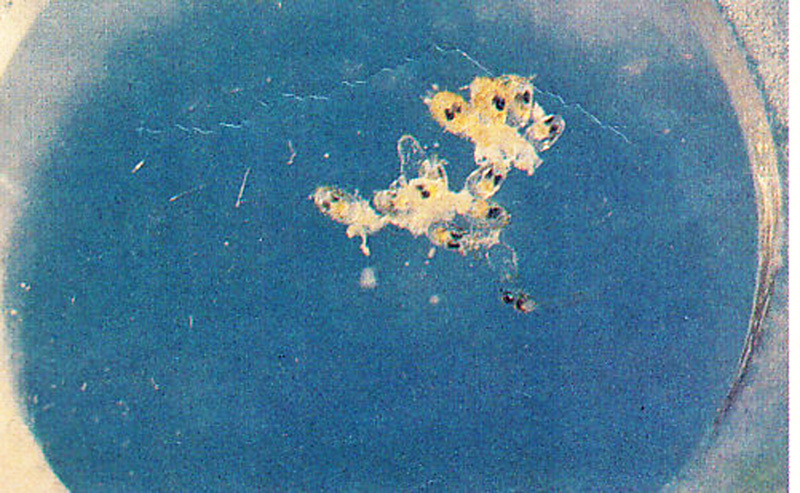 The smallest larval form shown is already a week old and the post larval form at the 12 o’clock position is 35 days old. The juvenile at the top is a few days short of 8 weeks of age. Jewelfish have a long larval life, and although many eggs are laid, few survive in nature to the juvenile stage. Ciardelli. A. 1967. The Anatomy of the Feeding Mechanism and the Food Habits of Microspathodoncrysurus (Pisces: Pomacentridae). Bull. Of Marine Sci. Vol. 17. No. 4. PP 845-883.